It’s no secret to anyone who knows me that a few years ago, I went through a serious “cupcake phase”. It lasted for about 3 years and included a lot of day-dreaming about cupcake flavors and owning a bakery. I even used to watch “Cupcake Wars” and “DC Cupcakes” on TV and taste-tested cupcakes in bakeries all over California (I called it “research”)! I studied recipes and created some of my own, trying them out on all of my friends. Once I did a wedding…and made 200 cupcakes, which was really fun but kind of hard. I seriously could think of nothing else. Then it hit me…I’m pre-diabetic so what am I doing making and eating cupcakes all the time? I also had a knee replacement which led me to the conclusion that owning a bakery was preposterous! In fact, there are already two near us here in Kaysville, Utah so why would we need another one? Plus, I don’t want to be owned by a business. Finally, my phase came to an end out of necessity, so I relaxed and stopped obsessing about cupcakes (much to my family’s sadness)! I guess this means we have enough cupcake recipes to last awhile! This will involve more testing though (oh darn). I should mention that my cupcakes are a little different. I love to use fresh ingredients and create unique flavors. Fruit in season is a huge focus for me as well as NO shortening (hydrogenated vegetable oil). Once I substituted canola oil for butter, but they didn’t taste as good. Since cupcakes are really just a treat, I figure a little bit of butter is completely fine! My “flagship” cupcake is called “Orange Blossom”. Loaded with mandarin oranges and fresh orange zest, I hope you enjoy them! Preheat oven to 350 degrees. Bring butter, eggs and milk to room temperature. Sift flour, baking powder, baking soda and salt into a bowl; stir to combine with a wire whisk; set aside. Using a hand mixer or Kitchen Aide, cream butter for 3 minutes; add sugar and continue creaming until light and fluffy, about 5 minutes. Add eggs, one at a time, mixing to combine after each. Mix in vanilla until combined. Add dry ingredients in 3 parts alternating with wet ingredients in 2 parts. Mix between additions until just combined, scraping down sides of the bowl with a rubber spatula. Be careful not to over-mix…I have learned from experience that this makes the batter dense and tough. Fold in the orange zest (if you add to the mixer, it will stick to the paddle attachment!). Fold in the mandarin oranges (do this gently because otherwise they will break up into mush). There’s no need to chop the mandarin oranges because they fall apart as you mix for a few seconds. Using an ice-cream scoop, spoon a level amount of batter into the papers. Bake for 18-20 minutes; makes 24-26 large cupcakes. High altitude baking: Set oven temperature to 370º and bake for 13-15 minutes. Cream butter and add powdered sugar. Once combined, add vanilla, zest and juice. Mix until smooth. Add additional juice for a creamier texture. 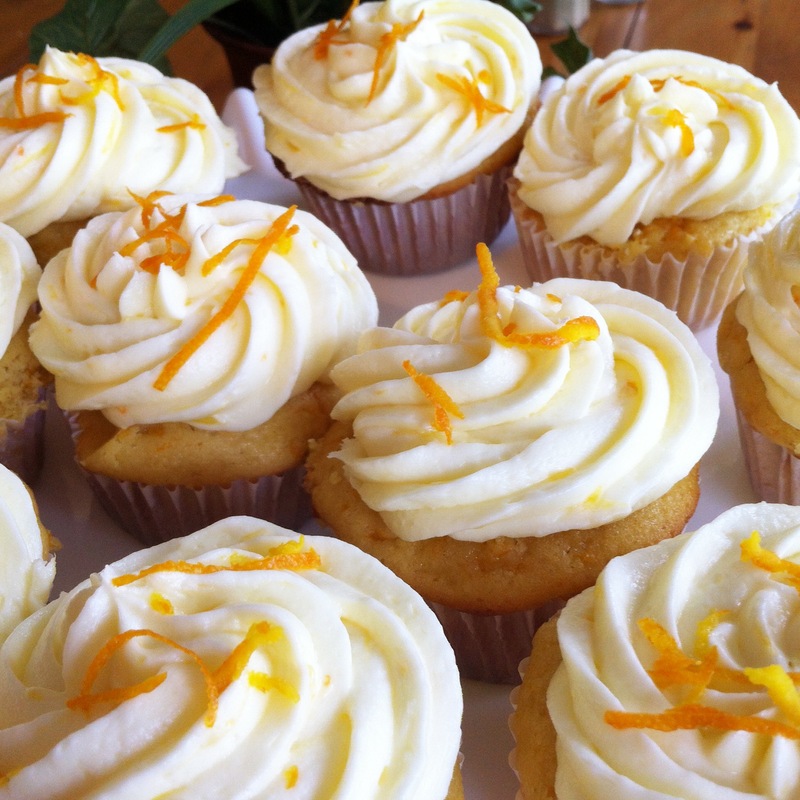 Frost cupcakes in desired style; top with fresh orange zest. If I still had saliva, my mouth would be drooling! Peanut butter and chocolate would be my first choice. These sound fantastic! I look forward to trying them. Ah! The coveted orange blossom recipe! Thanks so much for sharing! You are welcome! Thanks for caring!